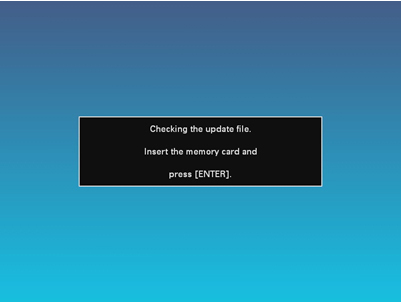 Before starting the update, we recommend that you back up to a computer or a memory card the image and music data that are saved on the digital photo frame's internal memory. This page provides instructions on how to update the firmware for Digital Photo Frame DPF-E710. Please read the instruction thoroughly before installing the firmware update. - If the version is displayed as 1.08.1.00 or lower, update the firmware in accordance with below procedures. - If the version is displayed as 1.20.1.00 or higher, you do not need to update the firmware. Improved stability at slideshow display. Note: Operation is not guaranteed for all PCs installed with a compatible OS. One of the following types of recording media (Memory capacity is between 32 MB and 32 GB). Refer to About the memory cards in the Digital Photo Frame Operating Instructions for more details about compatible recording media. Note: Operation is not guaranteed for all Memory Stick media, SD memory cards, or USB flash drives. IMPORTANT NOTE: PLEASE READ CAREFULLY. This is the dedicated update file for DPF-E710 only. You cannot use this file with other Sony digital photo frames. This Digital Photo Frame firmware update and any changes incurred by it are permanent. It is not possible to return to a previous firmware version after upgrading this firmware. By continuing this update process, downloading and upgrading this firmware, acknowledgement of awareness and understanding that this update cannot reverse this installation. Save the file DFE710V2.zip to your desktop. Right-click the downloaded zip file DFE710V2.zip. The DFE710V2 folder is now open on your computer's desktop. Right-click the downloaded zip file DFE710V2. Click Next in the Welcome to the Compressed (zipped) Folders Extraction Wizard. Double-click the saved file DFE710V2.zip. The DFE710V2 folder is created on your desktop. The extracted DFE710V2 folder contains the following update files. Depending on your operating environment, some file extensions (.VUP or .vup) may not be displayed. This section describes how to update using a Memory Stick™/Memory Stick Duo™. If you are using an SD memory card, CompactFlash card, or xD-Picture Card, please replace Memory Stick™/Memory Stick Duo™ with your using memory card in the following explanations. Prepare an initialized (formatted) Memory Stick™/Memory Stick Duo™. For details about how to initialize (format) it, please see the Operating Instructions of your digital camera. Please use a Memory Stick™/Memory Stick Duo™ that has been initialized (formatted) by your digital camera, or initialized (formatted) by the dedicated Memory Stick formatting software Memory Stick Formatter™. Please use an SD memory card that has been initialized (formatted) by your digital camera. We do not recommend initializing (formatting) with a computer, as the DPF-E710 may not recognize the recording medium, depending on the type of initialization format. If you have no choice but to use a recording medium that has been initialized with a computer, copy a JPEG image file and check to see if it is displayed correctly on the DPF-E710. The firmware update may fail if the Memory Stick™/Memory Stick Duo™ contains other files as well as the update file. You should therefore always use a Memory Stick™/Memory Stick Duo™ that has just been initialized (formatted). Copy the update file to the Memory Stick™/Memory Stick Duo™ using either of the following methods. Insert the initialized (formatted) Memory Stick™/Memory Stick Duo™ into the Memory Stick slot on your computer. Open the DFE710V2 folder on your desktop, and copy the update file DFE710V2.VUP inside it to the Memory Stick™/Memory Stick Duo™. Without creating a folder, drag and drop the update file to the root directory of the Memory Stick™/Memory Stick Duo™. Insert the initialized (formatted) Memory Stick™/Memory Stick Duo™ into the Memory Stick slot on your digital camera. Open the DFE710V2 folder on your desktop, and copy the update file DFE710V2.VUP inside it to the Memory Stick™/Memory Stick Duo™ that you have inserted into your digital camera. Perform Steps 1 to 6 with the buttons on the digital picture frame. The operation cannot be performed with the remote control. Insert the Memory Stick™/Memory Stick Duo™ containing the copied update file into the Memory Stick slot on the Digital Photo Frame. Press the (ENTER) button. Make sure that the following message is displayed on the LCD screen. If the above display does not appear on the LCD screen after several minutes or if the display is distorted, remove the AC adaptor from the Digital Photo Frame and reconnect it. Next, make sure that the (Power) button is green, press the (Power) button to power off. Check that the (Power) button is red, and start the update process again from update the firmware. The LCD screen changes to the Updating... screen, and the firmware update starts. It takes about 1 minute to perform the firmware. Also ensure that the Memory Stick™/Memory Stick Duo™ is firmly inserted into the Digital Photo Frame during the update so that it cannot fall out. 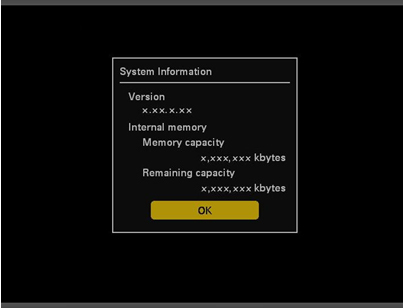 The Digital Photo Frame may malfunction if power to the device is lost, or if the Memory Stick™/Memory Stick Duo™ is removed during the update. When the Completed message appears on the LCD screen, press the (Power) button to turn of the power of the digital photo frame. Remove the Memory Stick™/Memory Stick Duo™ from the digital photo frame. 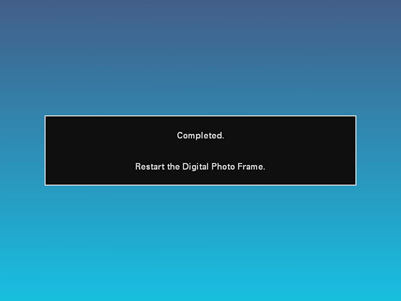 The first time you turn the power on after the update, the digital photo frame will take longer to start than usual. Check the firmware version is 1.20.1.00. The firmware was not updated correctly. Perform the update again from the beginning following the update procedure. The update file in the Memory Stick™/Memory Stick Duo™ is not needed anymore after you performed the firmware update. Please remove it from your Memory Stick™/Memory Stick Duo™. There is no need to restore backed up image and music data to the device after a firmware update if the image and music data in its internal memory is the same as it was before the firmware update. You should therefore check the image and music data in the device's internal memory before attempt to restore backup image data to its internal memory.